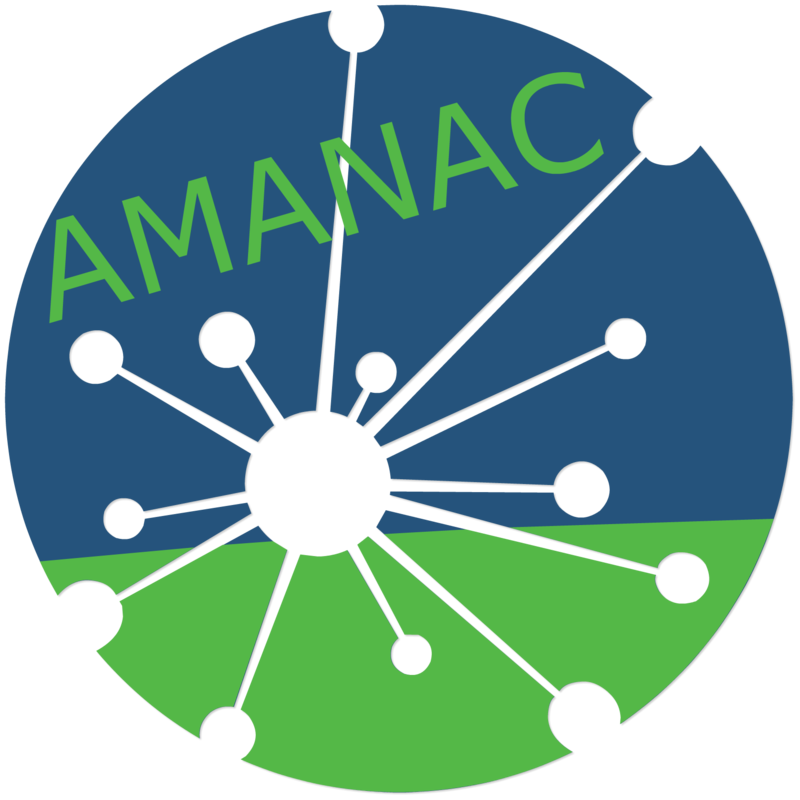 The European Committee for Standardization (CEN) was mandated in 2004 for the development of horizontal standardised methods for the assessment of the integrated environmental performance of buildings. CEN TC350 expanded this mandate to sustainability, and opted for a life cycle approach as the basis for all assessment. Hence, the TC develops standards, technical reports and technical specifications to provide methodology and indicators for the sustainability assessment of buildings. 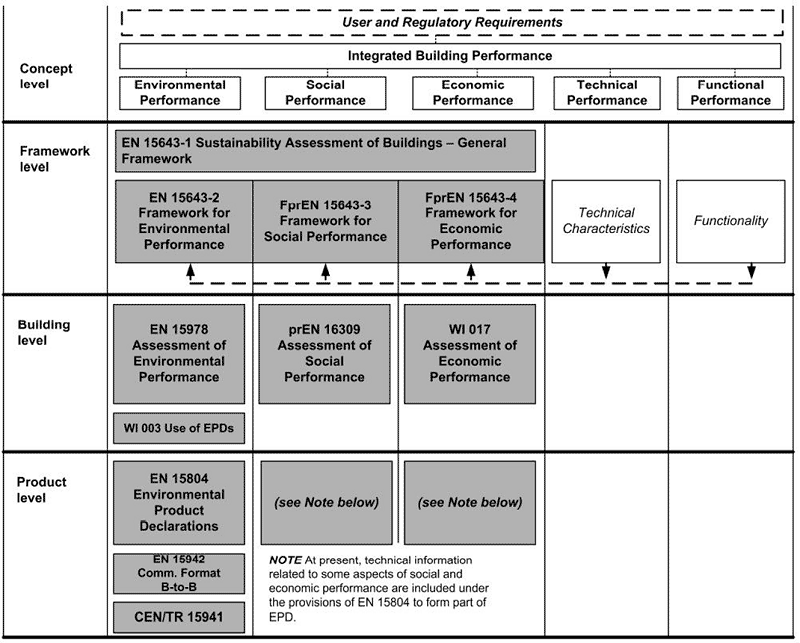 The normative framework for the sustainability assessment of buildings, provided by CEN-TC 350 series of standards, covers environmental, economic and social aspects (EN 15643-1, 2010). The TC works at four levels (concept/ framework/ building/ product) and for five types of performances (environmental/ social/ economic/ technical/ functional). The environmental assessment is the most advanced aspect, with standards developed at the building level and at the product level. The life cycle environmental approach adopted in this project follow the two standards dedicated to the evaluation of the environmental impacts of buildings: the EN 15978 (2011) and the EN 15804 (2012), for the building and material levels, respectively. 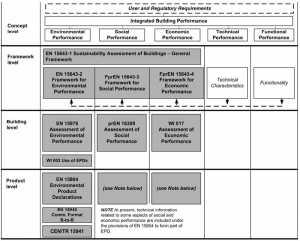 EN 15978 (2011) provides calculation rules for the assessment of the environmental performance of new and existing buildings based on a life cycle approach. It is intended to support the decision-making process and documentation of the assessment of the environmental performance of a building. For a complete overview of the methodology the reading of the standard is referred. At the product level, EN 15804 standard defines the product category rules to develop Environmental Product Declarations (EPD) of construction products. EPDs are Type III environmental declarations, according to ISO 14025 (2006) and are often a good source of environmental data for a life cycle analysis. An EPD is a particular type of LCA, conducted using a defined set of Product Category Rules (PCR). Many PCR can be used for construction products (CPA, 2012) but only EPD following the same PCR can be compared.